The variety of –omes and –omic sciences has exploded in the last 20 years. 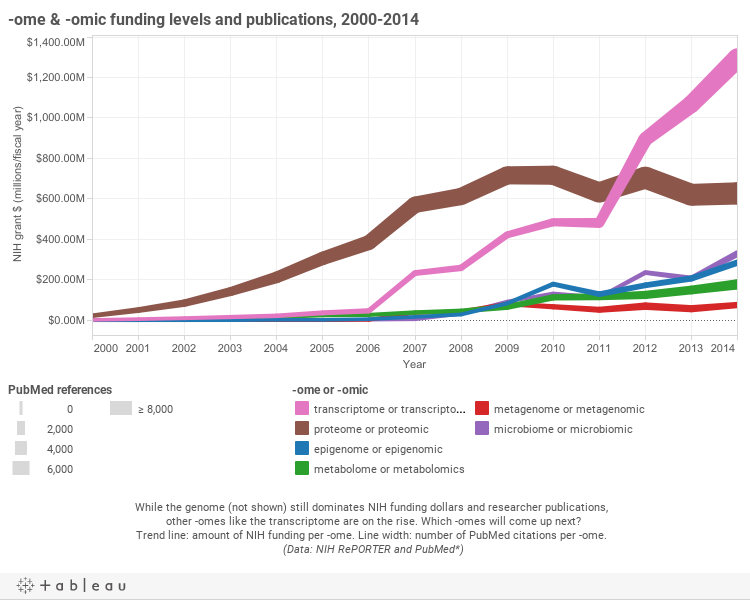 Proteomics, metagenomics, transcriptomics...which –omes are on the rise? It all started with the genome: the total complement of genes within an organism, a word coined roughly 80 years ago by fusing gene and chromosome. In the yeas since, the list of –omes and –omic technologies under study has grown at a brisk pace, to a mix of excitement, wonder, resignation, and ridicule. Why study an -ome? Because no one gene, protein, enzyme, etc., acts in isolation. Understanding how all of the components of a biological system work together, and with other systems’ components, gives a more complete picture of the interactions and key drivers that keep cells, tissues, and organisms going — and where things can go awry to cause disease. We approached three Broad scientists with one question: What, in your opinion, might the next big –omes might be? Which collections of interactions, molecules, or other biological features are poised to be major research drivers in the near future? I think the combinome — the space of cellular responses that are possible upon treatment with more than one perturbation (whether that perturbation is a small molecule or a genetic reagent). Think about it this way: Say one has 50 drugs that might be efficacious for a particular person's tumor. Use of any one of them will, ultimately, be ineffective, as some fraction of the tumor cells won't respond to it. So, naturally, you want to try combinations. [I]f one has 50 drugs [to test], that's 1,200 pairwise combinations; we'd run out of people before we could do a clinical trial. Back when HIV was treated this way (with antiviral "cocktails"), there weren't that many drugs and each was more or less added to the cocktail as it was developed. But for cancer we now have so many drugs, in one way of looking at it, that we can't possibly conduct clinical trials on all of the possibly useful combinations. So if one has 50 drugs, that's 1,200 pairwise combinations; we'd run out of people before we could do a clinical trial. So it is imperative that we be able to test them in faithful, scalable preclincal models. Now move from drug to gene space... there are 20,000 protein-coding genes, give or take. By the same math, that is 199,998,000 combinations of genes! Speaking as a cancer researcher, I would say the dependome, the catalog of all genetic dependencies and vulnerabilities associated with a tumor's genomic alterations. In the last decade we focused on creating a catalog of all the genomic alterations that occur in tumors, and made tremendous progress in translating this information into cancer treatments. For example, EGFR mutations create a vulnerability in lung cancer that we can exploit with targeted agents. However, for many cancers, we can’t use the information from the tumor genome because we don’t fully understand the consequences of the tumor’s genomic alterations. [F]or many cancers...we don’t fully understand the consequences of the tumor’s genomic alterations. This situation will change in the coming years. For instance, we can take a cell line derived from a human tumor and use genome-scale functional genomics to identify all essential genes or gene dependencies in that cell line. Doing this for thousands of cell lines, each derived from a different tumor, will let us understand the vulnerabilities of all tumors, and tell us that if a tumor has a certain set of genomic alterations, it will have a particular profile of vulnerabilities. This information will inform us teach how to select treatments and where to focus our efforts to develop new therapies. I think the next big “ome” to watch for is the interactome. We’ve gotten pretty good at studying individual genes and gene products. But seldom do gene products work alone. Cells are collections of macromolecular assemblies that require many components to execute important functions. Moreover, these assemblies can have different components depending on their cellular origin, and can change their compositions dynamically in response to perturbations. So I really should qualify this: Interactomes are the next big thing. We’ve gotten pretty good at studying individual genes and gene products. But seldom do gene products work alone. It’s exciting to think about the many classes of interactomes we could study. For example, we might look at both static and dynamic protein-protein, protein-nucleic acid, and protein-small molecule interactome snapshots, or even more transient interactomes such as enzyme-substrate relationships (like kinases and the substrates that they phosphorylate). My suspicion is that cellular circuitry will make a whole lot more sense once we have an interactomic wiring diagram! What do you think, Dear Reader? Which -ome do you believe is rising to the top of the scientific agenda? Tell us on Twitter using the hashtag #opinionome. *Data collected by conducting keyword searches of NIH RePORTER and PubMed for *ome or *omic (e.g., transcriptome or transcriptomic, metagenome or metagenomic) for the years 2000-2014. Disclaimer: The opinions expressed here are solely those of the individuals quoted and do not necessarily represent the views of the Broad Institute of MIT and Harvard. UPDATE 6/28/16: You came through, dear readers, with some interesting -ome suggestions. Twitter reader @konoue suggested the immunopharmacogenome, while @fgrazz voted for the elementome ("[the] avail[able] elements [from] which molecules arise"). Meanwhile, reader @glycosdx added the athlome into the mix.